Students of Resonance Commerce & Law Program Division (CLPD) once again proved their mettle in Central Board of Secondary Examination (XII-Commerce) Result declared on 28th May, 2017. 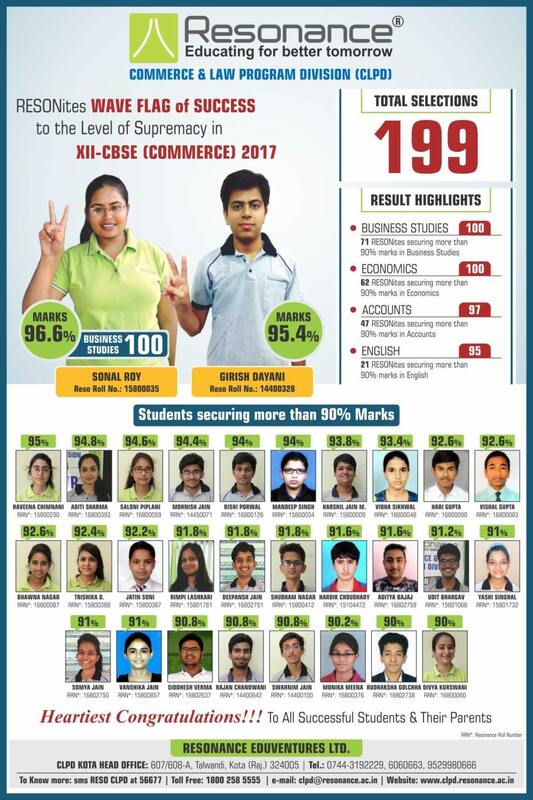 Total 199 Students of the Institute came out with flying colours in the Result which includes 30 Students with more than 90% aggregate. Sonal Roy became the Institute topper with 96.6% Marks. RESONite SONAL ROY Secured 100/100 in Business Studies. In Economics DIVYA KURSWANI, JATIN SHARMA, ADITI SHARMA and GAURAV AGRAWAL Secured 100 Out of 100 Marks. As many as 71 Students in Business Studies, 47 Students in Accountancy, 62 Students in Economics & 21 Students in English Secured 90% Marks & Above. Resonance Managing Director Mr. R.K. Verma & Executive Director Mr. Manoj Kumar Sharma Congratulates all the successful students and wishes them luck for their future endeavour.